A mini-musical is just that – a play with music which lasts between 5 and 15 minutes. Most mini-musicals have dialogue and one song, some have two. One mini-musicals is a two-minute opera. Each show is quick and easy to rehearse and great fun! Some of the 25 Mini-Musicals are as follows. A melodrama where the audience cheer the goodies and boo the baddies. A mini-musical with two songs where everyone is an insect. A mini-musical with two songs where everyone is an insect. A multi-media show where you show photos and others sing and play the songs about the action on the screen. Then there are shows with mad Martians, famous nursery-rhyme characters, and a show set on a runaway train, and many more. 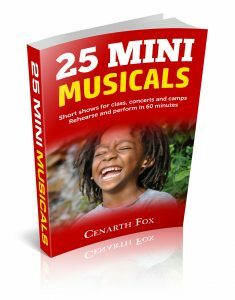 The 25 Mini-Musicals are available as a printed book and a CD, or as an eBook and a CD, both from Fox Plays. Go to Contact then Order Form.